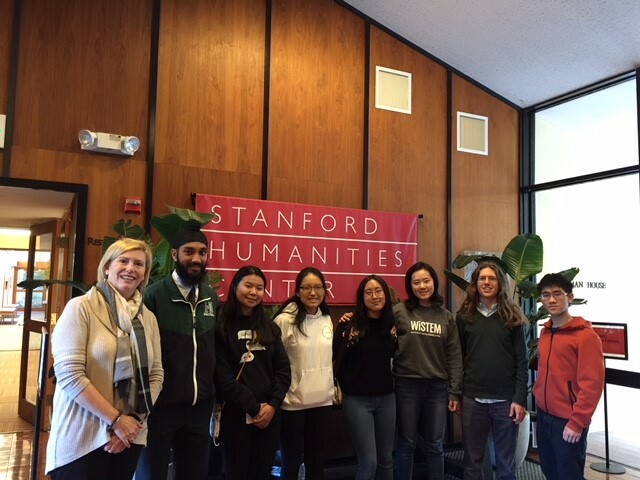 Last week, seven of this year’s Near-Mitra scholars – seniors Andrew Semenza, Amy Jin, Derek Yen, Emily Chen, Nirban Bhatia and Jackie He – visited the Stanford Humanities Center, which sponsors research into human history, arts, philosophy and culture. The students received a tour of the facility and met with the Hume Humanities Honors fellows. Each year, eight Stanford seniors are selected for the year-long fellowship. Donna Gilbert, upper school history department chair, said the trip was made “to foster and facilitate a conversation and collaboration between our two programs.” Gilbert also identified a desire to discover how the fellows and Harker’s scholars have had similar experiences during their research and use those experiences to develop “best practices” in humanities research. The idea to have the students meet with the Hume fellows was spurred by upper school English teacher Beth Wahl, who worked at the Stanford Humanities Center for several years. “It made sense to try to connect Harker’s Near-Mitra scholars to undergraduates doing humanities research and set up a conversation about research methods, the range of projects that fall under the humanities and the value of a humanities major,” Wahl told Harker Aquila. Visit Harker Aquila for the full story.